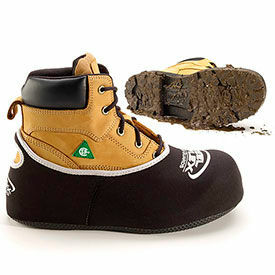 Disposable Shoe and Boot Covers Protect Footwear in Tough Industrial Settings. Disposable Shoe and Boot Covers are waterproof for protection in damp or wet areas. Covers are made of Tyvek, polypropylene or vinyl to provide long lasting durability. Easy slip on style and snug fit. Available in a variety of boot and shoe covers. Ideal for hazardous or harsh environments including manufacturing, foodservice, industrial, medical, clean room and pharmaceutical applications. Sizes range from S-3XL, 8-12+ and One Size Fits All. Available colors are Blue, Clear, Gray, Orange, White and Yellow. Package quantities vary. 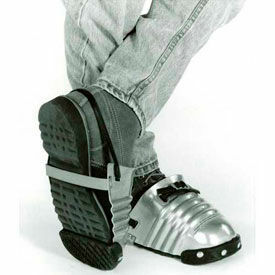 Protective Aluminum Strap-On Foot Guards Provide Protection To Foot-Instep For Construction And Industrial Environments. Foot guards are made of aluminum alloy, polyethylene plastic, 16 gauge carbon steel or thermo-foam plastic for long lasting durability. Foot guards are metal shields worn over shoes to provide maximum protection due to falling, rolling, flying objects or accidental tool blows. Guards withstand an impact of 75 foot pounds. Available styles areFoot Guards, Foot-Shin Guards, Foot-Shin Guards with Side Shield, Knee-Shin Guards, Knee-Shin-Instep Guards, Metatarsal Guards, Metatarsal Guards without Laces, Shin Guards, Shin-Instep Guards and Strap-On Foot Guards. Available types are Full Rubber Sole, Lightweight, Rubber Toe Clip, Sponge Pad, Steel Toe Clip and Unisex. Available sizes are Extra Large, Large, long, One Size, One Size Fits All, Short and Standard. Widths available are 4-6-1/2". Meets ANSI-Z41 Standards. 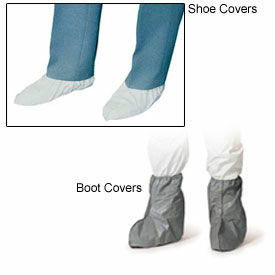 Swenco Waterproof Shoe Covers Are Designed to Fit Over Workboots Providing Floor Protection Against Moisture, Dirt, Mud, and Other Surface Staining Substances. These shoe covers feature a waterproof design that prevents dirt entry for indoor surface protection. 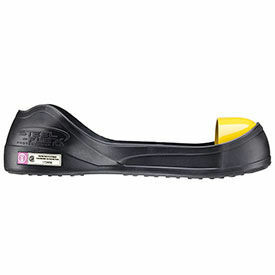 The slip resistant printed neoprene sole improves stability in moist or wet conditions for user safety. The re-useable neoprene design can be rinsed off allowing maintenance ease. The covers feature a rear pull loop for easy placement and removal. Includes a carbineer for convenient storage. Design is Printed Neoprene. Boot sizes are Under Men 8, 8-12, and 13+. Available sizes are M, L, and XL.